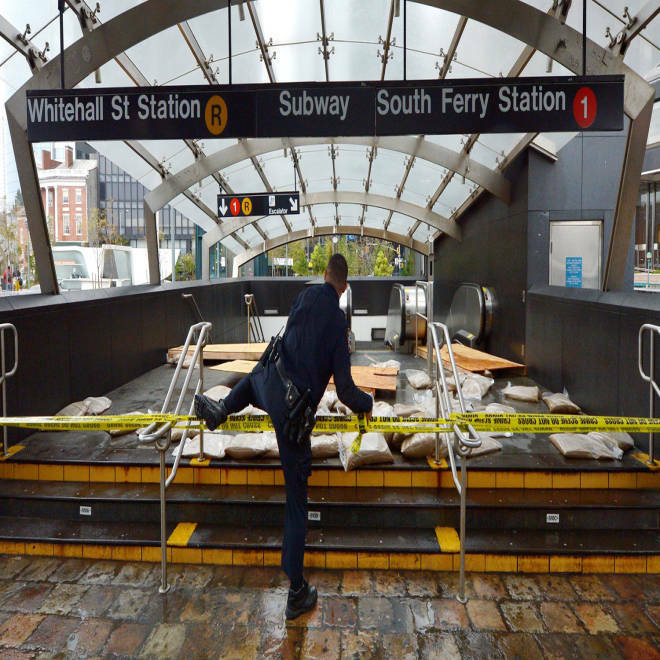 A police officer crosses over police tape at a closed subway station on Tuesday after Sandy drenched New York City. Updated at 9:16 p.m. ET: The unprecedented surge from Sandy’s floodwaters took a bite out of the core of the Big Apple's infrastructure, knocking out power to electrical substations and crippling a subway system used daily by more than 4 million people. The storm’s impact should be a wake-up call that the city – and the rest of the nation – needs to better prepare for the dangers of the coastal flooding, which is likely to become more frequent in the decades ahead, experts say. For now, the loss of power and a way to get around adds up to a major headache for many New Yorkers, and a hazard to some. New York City's Mayor Michael Bloomberg says that at least 10 people were killed during Sandy and the storms' "path of destruction will be felt for some time." New York’s subway system, one of the largest – and oldest – mass-transit systems in the world, was shut down Monday in advance of the superstorm. Bloomberg said Tuesday it could be “a good four or five days” before subways are back up and running, though Metropolitan Transit Authority Chairman Joseph Lhota cautioned it's too early to say how long it will take to restore full service. Floodwaters swamped at least seven subway tunnels under the East River, and transit officials called the damage unprecedented. 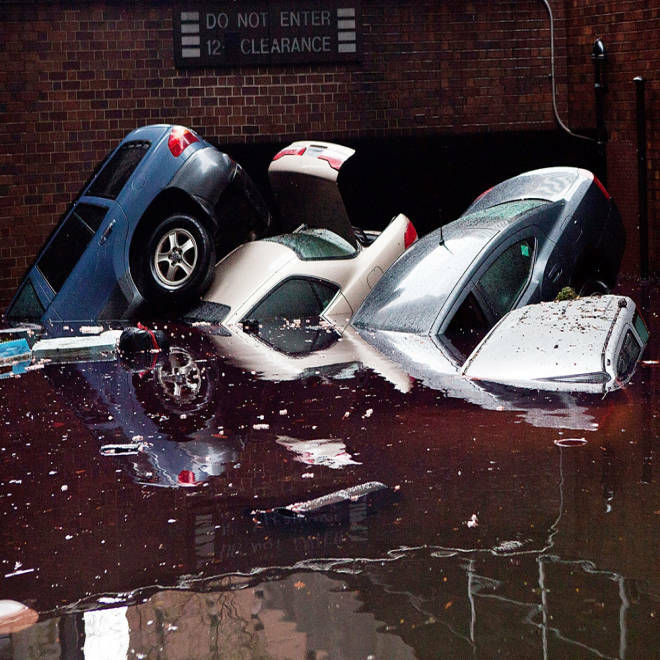 Nearly 14 feet of water rushed into lower Manhattan, shorting out the ConEd power station and destroying cars and homes. As a result, the city's subway system will remain out of service for several more days as cleanup begins. NBC's Anne Thompson reports. Bloomberg said the advance shutdown and the MTA’s temporary moving of much of its “rolling stock” of trains to higher ground may have spared the system from even more serious damage. But the immediate fix for the flooded system isn’t simply pumping water out of the tunnels. Unlike rainwater, the corrosive saltwater whipped up by Sandy could damage much of the subways’ electrical parts and equipment, says Radley Horton, an associate research scientist with the Center for Climate Systems Research at Columbia University. 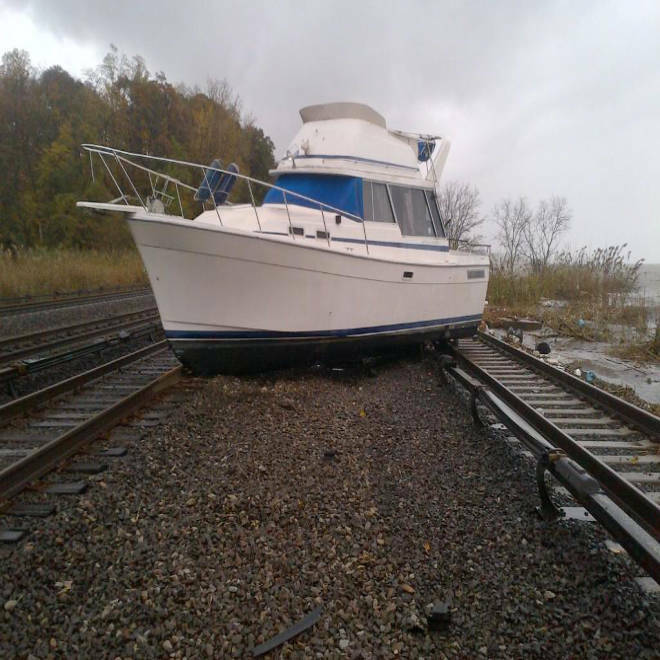 A boat rests on tracks at Metro-North's Ossining Station on the Hudson Line on Tuesday in the aftermath of Hurricane Sandy, in New York. “Saltwater and electricity don’t mix. Even after that water is removed, it’s going to take some time to replace the electrical equipment, test signals, that sort of thing,” Horton says. In a statement released Tuesday night, MTA Chairman Joseph Lhota cited "unprecedented challenges" the transportation authority faces as it tries to restore service, including flooding "up to the ceiling in the city's South Ferry subway station and 43 million gallons of water in each tube of the Hugh L. Carey Tunnel. Lhota said city buses are back on the road for limited service and will almost be at normal strength by morning. Wastewater treatment plants – New Yorkers rely on these facilities to treat sewage and wastewater from homes and businesses before releasing it into waterways surrounding the city. Located at sites around the city, many of these plants were overwhelmed during Hurricane Irene last year. Many of the city’s major roadways and bridges seem to have escaped catastrophic damage. Gov. Andrew Cuomo announced that five of the MTA’s seven bridges were fully inspected and reopened at noon on Tuesday. The two Rockaway bridges, Cross Bay Veterans Memorial and Marine Parkway-Gil Hodges bridges, and the Hugh L. Carey and Queens Midtown Tunnel remain closed. Buses were being phased back into service, with a full schedule expected for Wednesday. Superstorm Sandy made landfall Monday evening on a destructive and deadly path across the Northeast. Authorities were still assessing damage to New York's three major airports, and thousands of flights were canceled across the Northeast. "We are focused on reopening as quickly as possible. But we will not compromise safety," Pasquale DiFulco, a spokesman for the Port Authority, told Reuters. "We need to walk the runways and make sure there's no debris." The damage was so severe that Sandy should serve a wake-up call to cities around the world about the extreme threat posed by coastal flooding, scientists say. Horton, who was on a blue-ribbon commission that in 2009 examined the MTA and environmental sustainability, said one of the report’s main recommendations was to focus on flexible approaches in adapting to climate hazards. “In some ways this is the greatest transit system in the world, but I think we’re in uncharted waters,” Horton told NBC News. “I hope this storm is a wake-up call not just to our region …. but also nationally to help get adaptation on the map and help people understand the extent to which sea level rise will increase the frequency of coastal flooding events,” Horton said. New York Gov. Andrew Cuomo agreed that officials need to think about ways to better protect the nation's most populous city from storms that have been increasing in both intensity and frequency. “We have to resist the temptation for people to say, 'This is a once-in-a-100-years event; let’s just fix it and move forward,’” Cuomo was quoted as saying.